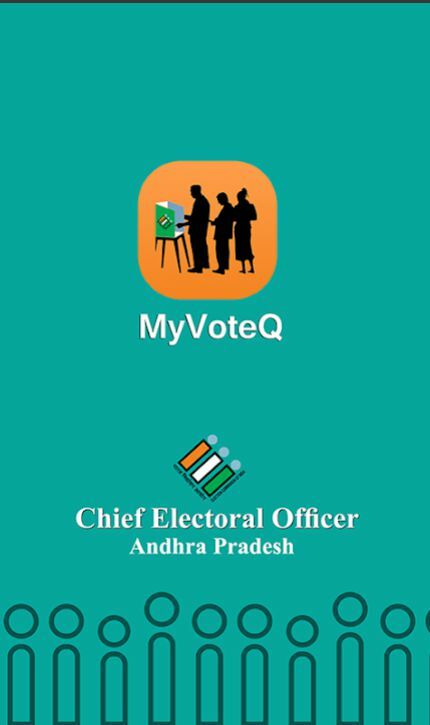 My Voter Q App Download: MyVoteQ is an App developed by Chief Electoral Officer Andhra Pradesh to inform the voters regarding the queue at their polling booths. Voters can plan their voting based on the length of the queue. Voters can also find out the Queue related information by calling at toll-free number 1950. 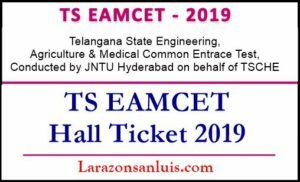 Now all polling booths for the General Elections in Andhra Pradesh of 11th April 2019 have been added. It may be downloaded by all the voters and may be used on the Poll Day in AP. 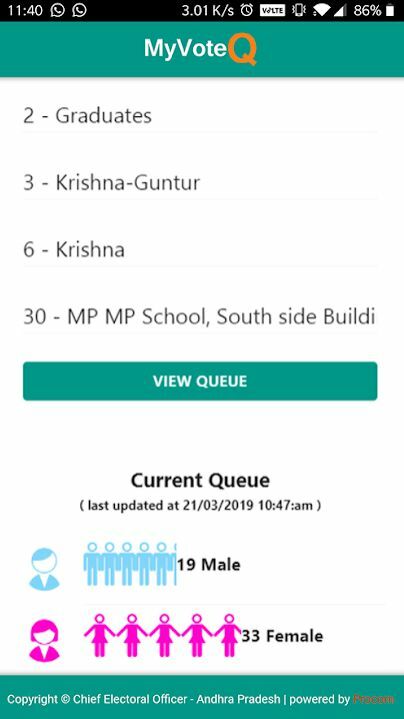 Chief Electoral Officer Gopal Krishna Dwivedi has come up with a mobile application MyVoteQ that enables the people to know about the status of the queues at polling booths. With this, they can avoid waiting for long periods to cast their vote. 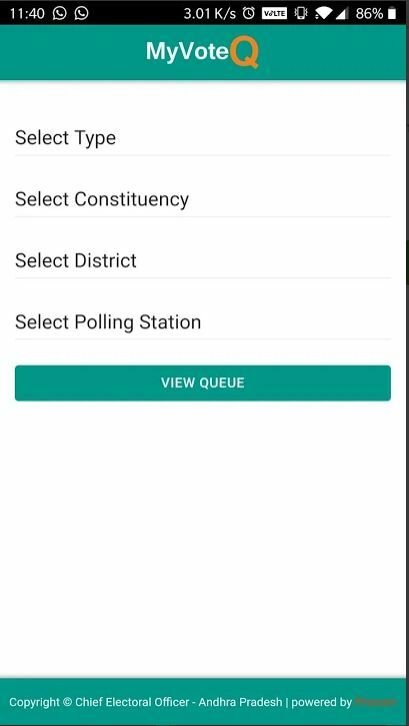 According to an official release, the app gives the number of voters standing in queues. Designated persons (election staff/volunteers) will enter the queue related information in the app every 15 minutes. The app is to be downloaded from the Google Play Store. 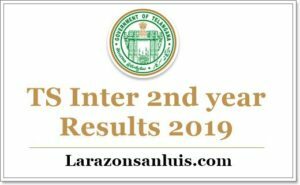 If the designated persons cannot enter the data, the district – level designated officers have to do it by finding out the status over phone and update the status through weblink/URL http://3.209.192.41 with logins provided to them. Voters can plan their visit to the polling stations as per their convenience. 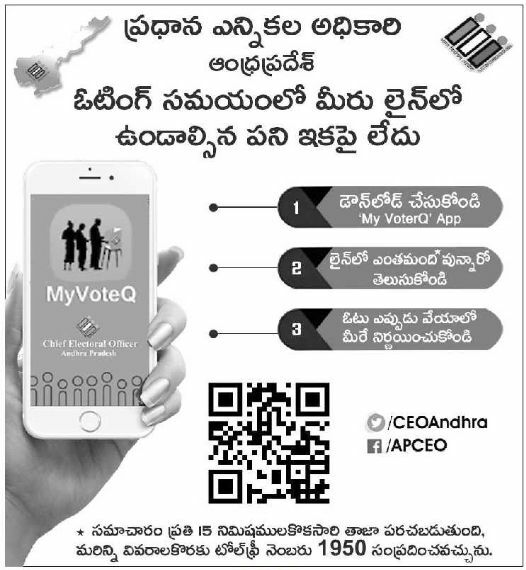 District Collectors have been asked to activate the system and issue wide publicity regarding the number of voters in the queues either through MyVoteQ app, call centre with toll-free number 1950, or through web-link. 2. 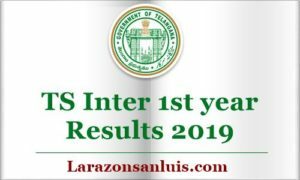 Select Your Constituency, District, Polling Station. 3. Current Queue Status will be displayed on the Screen.